My most recent CSA box had a great selection of fall vegetables and lettuce greens. This salad was an easy make-ahead recipe that I ate all week. I roasted beets by wrapping them in tin foil and baking them at 375 degrees for two hours. I also diced the butternut squash (only about half the squash), wrapped it in tin foil, and threw it in the oven with the squash for about an hour. Then, I let both packets cool, and simply put them in the fridge. The next day, I peeled and sliced the beets (after you roast them, the skins slide right off). 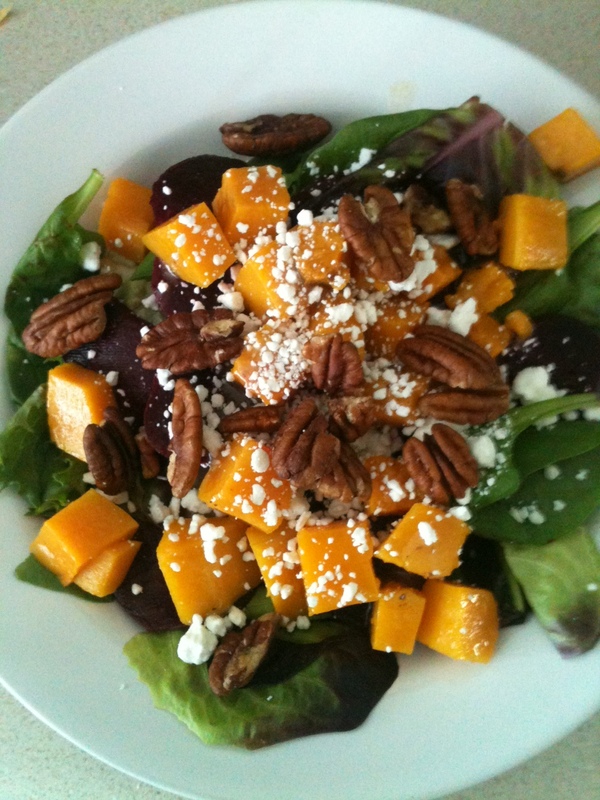 I put some of my freshly washed mixed greens in a bowl, topped with sliced beets and diced squash, them sprinkled some pecans and goat cheese on top. Easy, delicious and pretty dang healthy!